I saw The Happening this weekend, M. Night Shyamalan’s new movie, and just to add to the creepiness I was the ONLY person in the theater! I really thought they should have come out and handed me a giant remote so I could turn the temperature up and pause it when I had to run to the Ladies room. No such thing happened though. I did love the movie! But something even scarier happened yesterday, I layed out my Dollar and a Half cardi to measure and noticed something. Do you see it? The bottom 3 sets of cables seem to have more space, like and extra 2 rows in them. Now I know I’ve been following the same pattern. Did my guage tighten? Later when I get home and find the patience I’ll actually count rows. grrrrr! 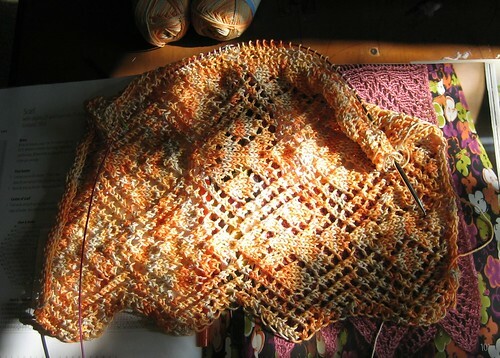 First up the Gossamer Stars Scarf from the new Interweave Knits. 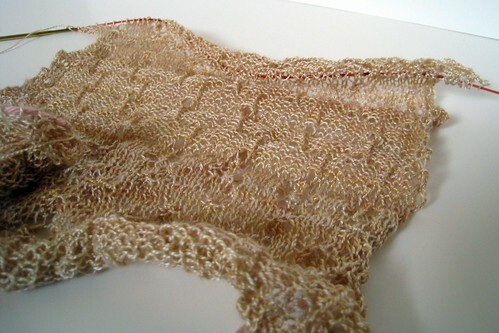 I’ve had this Handmaiden lace silk since last April. It looks beautiful in this pattern. I did go down a needle size so it will be slightly smaller. 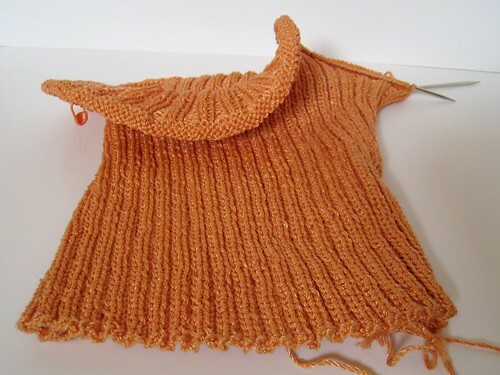 The Off The Shoulder Tank from Vogue Knitting, I’m using Berroco cotton Twist that I’ve had in my stash for years. It’s gonna be a bit heavy but I think it will be ok.
Last up, the Dollar and a Half Cardigan, modified. This is the back. I wont be doing any vertical stripes, they are not flattering. 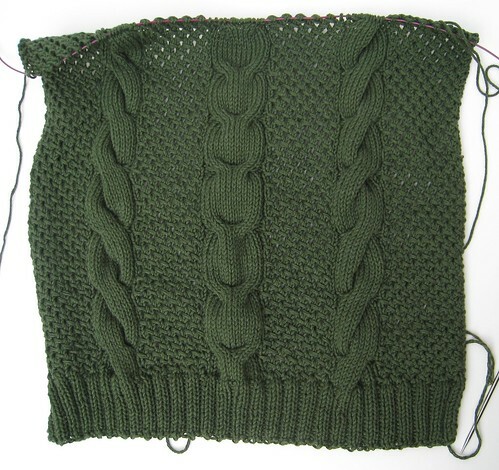 I love the lace pattern so I just did some calculations and added cables to the back. Thanks to a complete screw up on my part I cast on for the Dollar and a Half Cardigan completely quilt free this weekend. 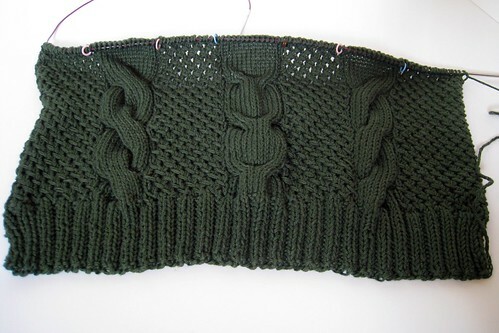 I failed to order enough yarn to complete Wicked, so while I’m waiting for the yarn to finish Wicked I started the DnHC! I decided to substitute Cotton Fleece for the Soft Linen. This is the first time I’ve used this yarn and I love it. 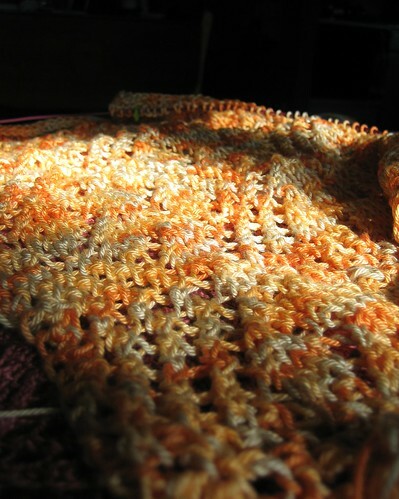 I don’t know if I like knitting in My New Space, knitting the lace pattern or the yarn more, maybe all three. I can’t seem to put it down! Hopefully I’ll be accepted to the KAL along soon and I’ll be posting more pictures there. Oh and I’m at a conference today and tomorrow and at the beginning the presenter said – if you’re a knitter feel free to knit! How awesome is that? 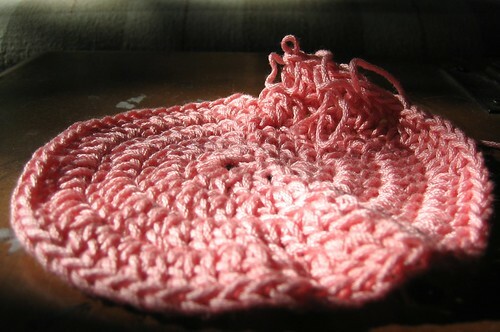 Had I known I probably would have cast on for a scarf or something small and easy to work with. Maybe I will tonight and bring it with me tomorrow. Remember when I mentioned the changes I’m making and the New and Improved Me? Well apparently mental rearranging requires physical rearranging for me. Two weekends ago I completely rearranged my living room, last week my office and this week the dining room area. Now my house is old and set up kinda of weird. Off what was the original dining room area is a small add-on, I’ve always thought there should be a comfy chair there were I can sit and read and knit, but the layout just made it really hard. Well I think I’ve got it figured out. Part of it is, I just have too much “stuff” and some of my “stuff” is just too big for this area. So I removed quite a bit of “stuff” and viola! Of course all of that “stuff” is now in the basement and waiting to be arranged and put away. Oh well I’ll do that another day. I’m very happy with the area, it’s well lit, it looks over my back yard and trees, I have no neighbors in back or on the side so I see nothing but yard and trees! Plus getting rid of some of the “stuff” that was just filler made way for some stuff I really like having around. Yarn! My radio is right there so I can listen to music or audio books if I want and I’m surrounded by yarn without cluttering up my living room. I’m quite pleased! You can’t call it cheatin’… if you’re just swatchin’! That’s my story and I’m sticking to it. I finally decided on Cotton Fleece as a sub for the Dollar n Half Cardigan. I went to the LYS thinking I’d got with a brown because I really liked the one pictured, but when I saw the Pine Green on sale, I couldn’t pass it up! It’s gorgeous and on sale! But I have sworn to finish Wicked first and I will. I had to rip back again. 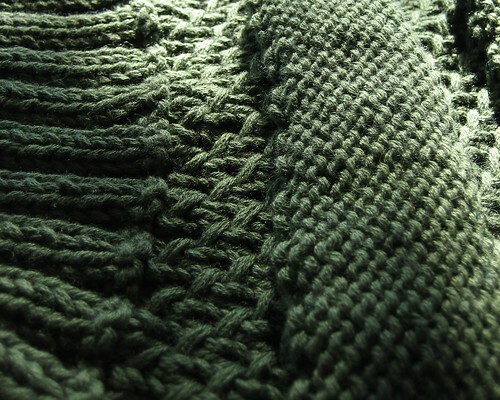 I had made a small mistake in the decreases, I thought I wouldn’t notice or care but after reading about a similar experience on another blog and the person said they never wore the sweater I realized I had to rip back. I’m almost back to were I was. If you haven’t been following along this is the 3rd time I’ve been this far on this sweater, the first time I realized it was way too big for me and completely started over. Thank goodness for top down knitting! I thought I’d pass this along since I can see from my stats a lot of people are coming across my blog while searching for the Dollar and a Half Cardigan and/or the Reynolds Soft Linen. 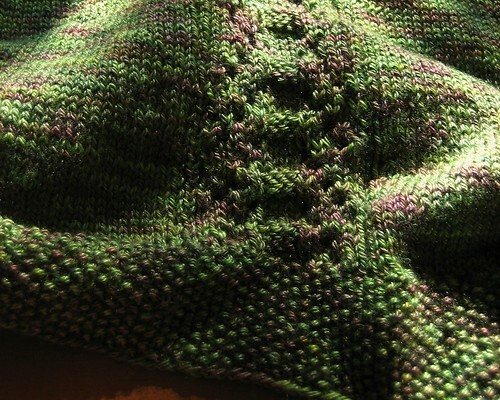 Thanks to some help from Pam, I found that Patternworks has it listed on line with an available date of 2/15/07. She saw it in Webs catalog but I didn’t find it on their website. Has anyone given any thought to substitutions for this pattern? Suggestions? 3/7/07 Edit: Webs definitely has it online now. I notice a LOT of hits for this post so here are some more online stores that have it. Good Luck! And yes I’m still looking for a substitute! So leave a suggestion! 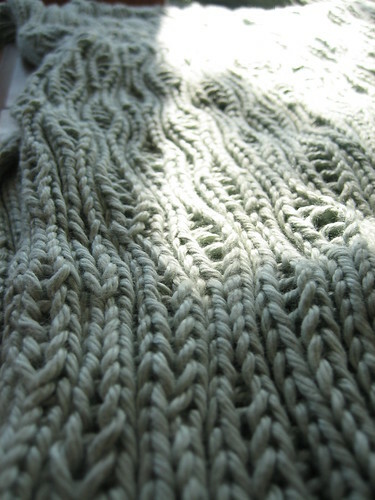 I love this pattern from the upcoming issue of Interweave Knits! Just one problem – I can not seem to locate the yarn. Am I losing it? Have I lost my mojo? Yarn Reynolds Soft Linen (53% linen, 47% acrylic; 94 yd [85 m]/50 g): #413 brown, 11 (12, 14, 17, 19) balls. Yarn distributed by JCA. 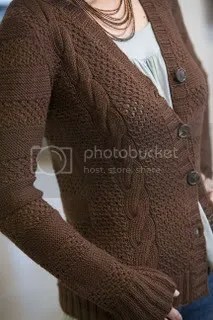 I’m thinking after Wicked and the Lace Leaf Pullover this will be my next big knit if only I can find the yarn! Help!